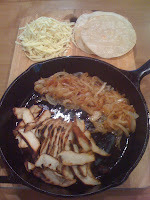 This is, in my unbiased opinion, the finest fajita recipe known to mankind. I wish I could claim the credit for it, but I can't. I learned how to make fajitas while working for a tour company in Alaska. A little strange, I know. My boss in Alaska was a guy who grew up running restaurants in Mississippi, and he knew his stuff. Especially when it came to grilling meat. Which brings up a good point. Strictly speaking, this recipe is not prepared using cast iron cookware. You can, of course, make this recipe with a cast iron grill pan, and I recommend carmelizing onions (and peppers) in a cast iron skillet. While my barbeque grill is extruded steel instead of cast iron, it is still a safe, non-stick cooking method... so I'm stretching the rules. I highly recommend serving these with shredded cheese, caramelized onions, chopped scallions, chopped lettuce, chopped tomatoes, chopped cilantro, lime wedges, sour cream, guacamole, and a side dish like spanish rice. Of course, you'll want some warm tortillas to put everything in. You can use this marinade on dang near anything. 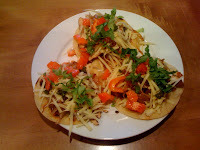 We typically use chicken breasts or beef top round. Buffalo is great, too. Pork wouldn't be out of place. Mix tamari, worcestershire, chili powder, cumin, and Canadian steak seasoning together in a blender. While blender is still running, slowly add the oil until it is well incorporated. (Note: If you put the oil in too fast, or just mix it all together... you'll never get the marinade to make an emulsion, and you have to start over). Marinate the meat for 6-8 hours in the refrigerator. Light a charcoal fire. I strongly recommend natural hardwood charcoal (actual chunks of charred wood, as opposed to briquets), and a grill chimney (shown at right) so you don't flavor your meal with petroleum distillates and coal dust. When the coals are ready, spread 'em around and place the grill over them. Once the grill has heated for 5 minutes or so over the coals, clean it with a wire brush, and then spray or wipe it with oil. If you're using a cast iron grill pan for this recipe, prepare the pan by placing it on the second-highest rack in the oven, and then heat it up for 10 minutes (until smoking) under the broiler. 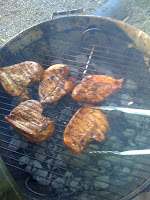 Place the marinated chicken on the grill, and cook until done, flipping often enough not to burn it. This will probably take 15-20 minutes (with either method). Internal temperature should be about 160 degrees F when you pull it. Once off the grill, rest the meat on a cutting board loosley tented with foil for about 10 minutes (Note to the FDA: the chicken will warm to 165 degrees F as it rests). Slice the chicken into 1/8-inch thick slices, against the grain if possible, and serve immediately with warm tortillas and whatever toppings and side dishes you may have concocted.